This section provides a tutorial example on how to perform XSLT (Extensible Stylesheet Language Transformations) in XML Notepad 2007. XML Notepad 2007 can not be used to apply generic XSLT (Extensible Stylesheet Language Transformations). But it can apply special XSLT transformation that generates HTML documents. 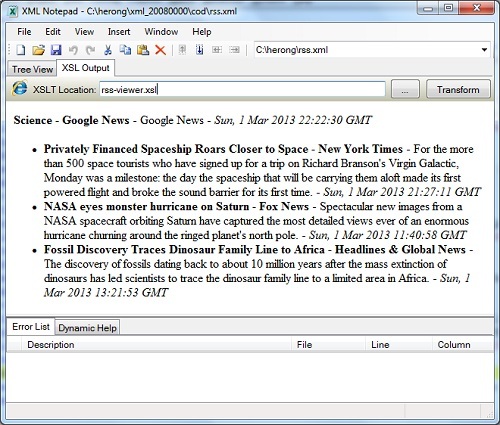 The example below shows you how XML Notepad 2007 can be used apply an XSLT transformation as HTML viewer for RSS documents. Of course, if the XSLT file is not provided in the XML document, you can specify it through the "XSLT location" field.